Home > Apologetics Topics > Questions About the Bible > Did Jonah die in the belly of the Fish? 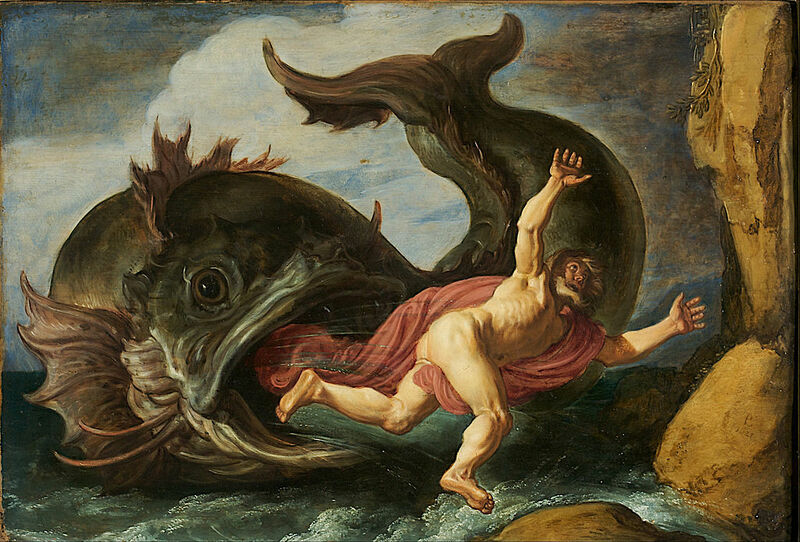 I was studying the book of Jonah, and wanted to get your thoughts on the idea of Jonah actually dying in the belly of the great fish that swallowed him. Jonah 2:1 says that Jonah prayed from inside the fish. Jonah 2:2 says he called to the Lord from the depths of the grave (Sheol). This would fit the "death and resurrection" theory because he would first pray from the belly of the fish, then after death, he would pray from Sheol (Abraham's bosom). Jonah 2:6 refers to Jonah being in the earth (which happens to be the place where Sheol is) and his life being brought up from the pit. Also, even if Jonah died and went to Sheol, his body would have remained in the fish while his soul departed. His body would still show the signs of being in the fish 3 days after the resurrection. What is also interesting is how Jonah chapter 1 represents the old testament law (go to Nineveh and preach against it ,1:2) Chapter 2 represents the death and resurrection of Christ, and chapter 3 represents the New Testament grace (go and proclaim to it the message,3:2) . Of course Jesus was much more willing to go than Jonah! What do you think, Bible Answer Dude? The message you sent is interesting, but I'm still not swayed that Jonah actually died in the belly of the fish. I have two main reasons for my view. First, although Jonah did say (Jonah 2:2)" And said, I cried by reason of mine affliction unto the LORD, and he heard me; out of the belly of Sheol cried I, [and] thou heardest my voice. ", this does not necessitate an actual death. The word Sheol is used many times of a physical location, the abode of the dead. But it is also often used to describe a state of dread or feeling as if you could die. Psalm 116:3 says, "The sorrows of death compassed me, and the pains of Sheol got hold upon me: I found trouble and sorrow." Also, "For great [is] thy mercy toward me: and thou hast delivered my soul from the lowest Sheol. ( Psalm 86:13 )" I don't think that David was actually dead before he wrote this psalm. Jesus here is drawing a comparison between the prophet and Himself. However, He is also opposing His future location (the heart of the earth) to that of Jonah (the belly of the fish). If we are to assume that Jesus meant Sheol when he said heart of the earth (and I feel this is a logical conclusion, because Joseph of Arimathaea's tomb was no more than a few feet inside the earth - hardly the "heart"), then He places Jonah's position not in Sheol, but still in the belly of the fish. Jesus here makes it known that Jonah was a type of Christ, but He also seems to say that His future is much greater in degree than Jonah's. One should always choose the simplest explanation of a phenomenon, the one that requires the fewest leaps of logic. Don't make unnecessarily complicated assumptions. I think this is a good rule of thumb for Biblical interpretation, as well. It definitely makes things easier for discussing these issues with skeptics! Hope this helps. Tell me what you think!